The blooming period is a month between January and February. This blue flower foliage sold as T. araujei seems a hybrid because the flowers of standard T. araujei is white. Tips of 3 petals are rounded. Basements of petals are white. Stamens and a pistil are not visible. Floral bracts are pinkish red. 15 flowers bloomed from the base side of the inflorescence at intervals of a day. 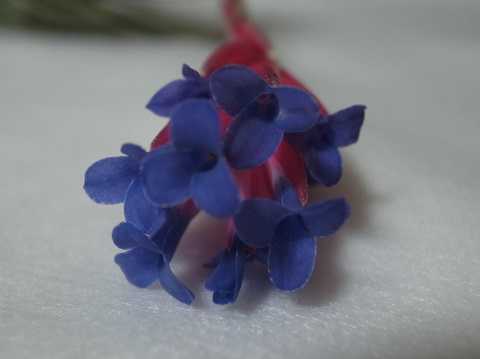 A flower blooms for 5 to 7 days. 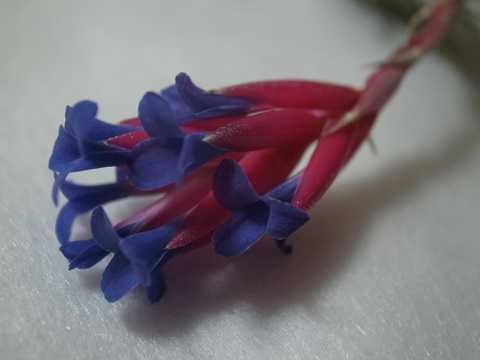 Front view of flowers of Tillandsia araujei. Stamens and a pistil are not visible.